Many children join the congregation in the sanctuary for the first time during the Advent Christmas season. Some come with families who are trying out church for the first time or are visiting church-going friends or family. Some are brought from the nurseries by their worshiping parents who think maybe they are ready to share the traditions that are so precious to their parents. Lighting the candles of the Advent wreath, the presence of a crèche and/or Chrismon tree, other visual decorations of the season, and the birth stories all appeal to children. While we introduce these things so that children know what they are about and adults understand them more deeply, we lead these newcomers to become ever more fully participating worshipers. * Advent is a time when many congregations go “off lectionary” for at least a Sunday or two. Sometimes they do that to accommodate special music and pageants. But more and more people are doing it because they sense the need to spend more time with the Christmas stories than with the early Advent texts. Since we often see more marginally involved folks in worship during December and since we can no longer count on public schools to teach the basic stories, it also feels increasingly important to present the key nativity stories in worship when people are expecting to hear them. Check out an alternate Advent lectionary created for just this purpose HERE. Scroll way down through the post to "Special Bulletin (sent to entire Rumors list last Tuesday)." 1. Rather than ask random individual or families to light the wreath, ask committees or groups in the church that are closely identified with the candle lit that week to do the lighting and reading. Briefly introduce them and the reason they are lighting the wreath this week as you call them forward. If possible include groups of children and youth (those who went on a mission trip?) as well as adults. 2. 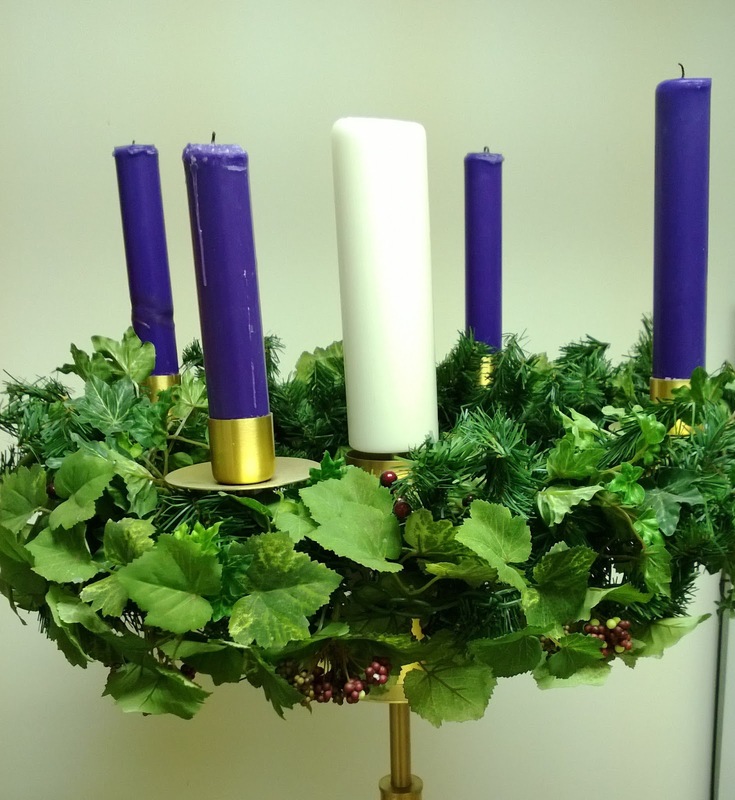 Highlight the wreath again at the close of the service with an acolyte lighting a mobile candle from the candle of the week in the wreath and carrying that light down the central aisle. A worship leader then sends worshipers forth to follow the light of that week’s candle out into the world. Week 1: The empty manger is in place. Other figures are set in visible spots around the sanctuary. With the children simply find the figures, name them and promise to tell more as the weeks go on. Week 2: Visit the shepherds at their corner of the sanctuary or bring them to the manger. Talk about how tired and dirty and looked down on the shepherds were. Briefly tell the story of the angels’ visit and what that meant to the shepherds. They left the manger aware that God knew who they were and invited them to see Jesus. They had hope that God was really making the world fairer. Week 3: Bring the Magi to the manger. Contrast them to the shepherds. The magi knew they were important and smart people. But when they saw that God was doing something important, they dropped what they were doing and traveled a long way to see what was going on. OR, bring Mary and Joseph to the crèche if you read the Mary texts this week. Week 4: Bring Mary and Joseph to the manger. Tell the stories of God’s call to each of them, what worried each about doing what God asked, and what they did. OR, lift each figure in turn to explore how that person turned aside to see what God was doing and get involved. Christmas Eve: Either start with the figures in a box and with the children set the figures in place telling the story as you do. Or, add the baby to the manger and marvel at the difference that one little baby made to the outsider shepherds, the important magi, Mary and Joseph and us. * If you display a Chrismons tree in the sanctuary every year, it will fairly quickly come to be simply “that beautiful tree in the church” unless ways are found to re-introduce the ornaments and their meaning repeatedly. One way is to explain them to the children during a children’s time or as part of the sermon. Before the tree is up, show the ornaments in your hands. Once the tree is up, use a flashlight to highlight ornaments related to each Sunday’s theme. This year, I found the following connections. Detailed ideas for each one are found in the weekly posts. Week 1: Add a stumpy trunk to the base of the tree. Or, feature the cross on the orb to highlight Christ’s lordship over the world. Or, look at all the circle or the alpha-omega ornaments that remind us that God is eternal. Week 2: I couldn’t find a good match for John the Baptist or his call to repent. Week 3: In keeping with the Rejoice theme, find all the stars. Week 4: If you are exploring the response of all the characters, note the gold and pearls – precious things that are worth turning aside to see and have. * You will find several reader’s theater scripts for the gospels this Advent. The goal is to help younger worshipers stick with longish stories and help older worshipers pay fuller attention as they hear familiar stories in a new way. Because they are read by adult readers, they address concerns raised by John Bell and others that we have given the Christmas stories to children for pageants which often robs them of some of their power. Advent hero/ines see beyond the present. Because children live so completely in the present, they need to be challenged to realize that things will not always be exactly as they are now. It is easier for them to believe that natural changes will occur, i.e. that they graduate to higher grades, be tall enough to slam dunk a basketball, etc. It is harder to believe that present problems will ever be resolved, i.e. that the people who torment them will change, that unfair situations will be rectified, that family problems will be resolved, etc. They count on the adults to continually point them to a changing future. Advent hero/ines see more than is just around them. They know God’s story and plan for the world. They know what is fair and loving. When they see things around them that are not as God intends and are not fair and loving, they work to change them. The Advent prophets did this as they pointed out what God wants and what was happening in their world differed. Most of the characters in the Christmas story also did this. Mary, Joseph, the shepherds, and the magi when confronted with God telling them something that just did not make sense in their world, believed God and acted accordingly. Nicholas Winton who died this year at the age of 106 single handedly got over 600 Jewish children out of Czechoslovakia just before the Nazis stormed in is an Advent hero. Learn his story HERE. Watch for descriptions of other Advent heroes and heroines in the resources for each week. * Go to Singing Christmas Carols in Worship with the Children for suggestions about how to highlight Christmas carols in worship and an annotated list of carols children can be drawn into singing. Go to Children Learning and Leading Carols in Worship for one church’s plan for young children to learn one carol each week to lead the congregation in singing as the Advent wreath is lit. * Christmas Story Books for Worship started with the worship leaders in the lectionary study group I attend sharing story books they have used in worship during Advent and Christmas. It is not a list of all the cool Christmas books I know, but a list of those I can imagine being read in the sanctuary. * Advent (Not Christmas) Stories for Children lists several children’s books that are Advent rather than Christmas stories. They explore the themes of the early weeks of Advent with children. * And of course remember to use the Scripture Index to find idea related to specific texts and to check the Topical Index for other Advent-Christmas posts. This year the fourth Sunday of Advent falls on December 23 - Christmas Eve Eve. That may require a careful look ahead at plans for that day and for Christmas Eve on Monday. Hello Carolyn! Thanks be to God for you and all of your hard work. I almost always read and glean from your wisdom and ideas! Thank you! Three years later... the scripts are in the resources for each week. There is no script for the first week, but are scripts for weeks 2,3, and 4.